1. How much movement will the system remove from my trailer? When you are sitting in your trailer with the STEADYfast® Stabilizer locked and someone else is walking inside, it will feel like there is very little to no shaking movement. The feeling has been described by some users as “Rock Solid” or “Like on a Concrete Foundation”. However, there is some slight movement from frame flexing, floor flexing, and soft ground. The amount will depend on the trailer design, type of stabilizing jacks, type of blocks, and the firmness of the ground. 2. Does the STEADYfast® Stabilizer stay on my trailer or do I have to install it when I set up camp and then remove and store it when I tear out camp? 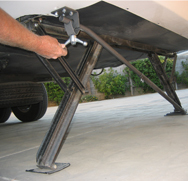 The STEADYfast® Stabilizer is only installed on your trailer one time. It stays on the trailer and moves up and down with the jacks. The only action required when you set up or tear out camp is to lock or unlock the three locking clamps. This takes about 45 seconds. 3. Will the STEADYfast® Stabilizer fit on my trailer? 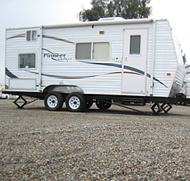 It will fit on most fifth wheels and travel trailers without any modifications. Most important there needs to be clearance for the 3 braces to extend between the bottom of the jack in the raised position and the frame of the trailer. One brace goes along the length of the trailer and two (one near the front and one near the rear) go across the trailer. Only four leveling jacks (drop legs, scissor, telescoping or other standard equipment) are required for the system to be installed. However, for the best performance, scissor or heavy duty leveling jacks are recommended. If you have any questions please call us or send a picture via email. We will be more than happy to assist with any special conditions. 4. How much extra time does it take to setup with the STEADYfast® Stabilizer? The only setup time required is to walk around the trailer and tighten the 3 locking clamps. This typically takes 25 to 45 seconds depending on the size of your trailer. If you are currently using a tripod and special wheel chocks, these are no longer needed. So you will save both time and storage space. If you are handy with a drill and can follow installation instructions, you should not have any problem installing the STEADYfast® Stabilizer. You will need to drill up to twelve 5/16 inch holes in the trailer frame and up to four 5/16 inch holes in your stabilizer jack base plates. The stabilizer is assembled with the provided bolts. First time installation takes about 2- 3 hours. Self threading 5/16” bolts are provided to attach the locking bracket to the frame so that the cover does not need to be cut or removed. The STEADYfast® Stabilizer System is bolted on top of the cover, right into the frame. You will just need to remove a few screws that hold the cover along the frame, pull the cover apart, and feel behind the frame to be sure the area is clear. Then replace the screws and install the brackets. 7. Is there a local distributor or shop where I can purchase the STEADYfast® Stabilizer and have it installed? We have several dealers established. If you would like your local dealer or shop to install the STEADYfast® Stabilizer please ask them to contact us or provide us their contact information and we will be more than happy to supply them with units. We find most dealers and RV repair facilities are willing to do this. 8. What Advantages does the STEADYfast® Stabilizer System have over a 5th Wheel tripod system? The STEADYfast® Stabilizer System has many advantages over fifth wheel tripods or king pin stabilizer jacks including performance, convenience, and time savings. It is also a complete system that will install permanently on most trailers that have 4 leveling jacks and does not require the use of special wheel chocks. When all factors are considered the total cost is very comparable to all equipment that is required for a tripod setup to work properly. The STEADYfast® Stabilizer System performance will be superior. 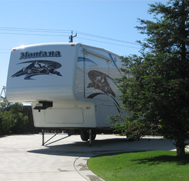 Tripods are designed to support some of the trailer weight and reduce lateral movement at the king pin of fifth wheel trailers. A well designed and fabricated tripod, setup properly on firm ground, will do a pretty good job at this. However, in many cases it is it is very difficult to set up properly and the tripod by itself will not stabilize the complete trailer. Unfortunately, some tripods are designed and manufactured in such a manner that they will normally have inferior performance. Special chocks as well as rear stabilizing jacks that eliminate lateral movement (scissor jacks will not do this) are required in addition to the tripod in order to reduce a significant amount of movement. The cost for all these items can range between $300 and $400. Tripods cost about $100, a pair of special wheel chocks about $100, and rear lateral stabilizing jacks about $150 for a total of $350. The tripod and wheel chocks have to be stored and installed and uninstalled every time you move your trailer. The STEADYfast® Stabilizer System was invented after I was totally dissatisfied attempting to stabilize my trailer using the king pin jack system discussed above. 9. Does the STEADYfast® Stabilizer System have any advantages over other brace type trailer stabilizing systems? a. The system completely stabilizes the front and back of the trailer. Only four good quality leveling jacks are required for the system to be installed. b. Three large locking handles are located at convenient locations just below the trailer frame. c. The rigid bracing system has no play or slop which is different from other bracing systems. No extra jacking or loading to take the slop out of the system is required. Each STEADYfast® brace both pushes and pulls eliminating the need for additional braces. d. The lower ends of the braces connect to a specially designed foot plate to insure it is connected firmly to the ground. e. The foot plate is self leveling eliminating any wobble or movement which standard foot plates allow. It is also much larger than standard foot plates providing firmer footing on softer ground. f. The upper ends of the braces connect to the frame with a locking clamp that was specially designed to eliminate any frame twisting or movement. g. The system is permanently attached to the trailer and moves up and down with the jacks. No set up is required other than tightening the 3 clamps. h. The braces extend completely across the frame so no custom cross frame supports or compartment bottom stiffener plates need to be installed. Please compare the advantages of the STEADYfast® Stabilizer System to other products to be sure you purchase the system that performs to your satisfaction. Click Here to see comparision to others.